Archery is the art, sport, practice, performance or skill of using a bow to fire arrows. Traditionally, archery is being used as hunting and or war weapon, but in modern times, it’s become a competitive sport and recreational activity. Here We discussed 5 fundamental points about archery for beginners. Why Should We Try Archery? It is such a sport that one can continue with its lifetime. Anyone can play with it – children, teenagers or senior. Starting from shot one or two arrow as recreational purpose one can carry it up to the Olympic Games too. The choice is up to you. You can use it to attend a competition or entirely for fun with your friends at the weekend or outing. Not only fun, but the archery can also help one to build his or her confidence. It also helps to make good and long term friendship. There is a verity of bow available, and you can choose according to your purpose. So, for inner peace of mind and self-development, we should try archery. As we said archery is an art, and it demands some minimum skill to shoot with it regardless of your purpose. So, to learn archery the best way to involve yourself with some local clubs. In a club, you will get a community where you get some beginner archery lessons and professional advice on how to perform or what bow is better for you. If there is no such club in your locality, no need to tense, you can buy and read archery related books from online. One of my favorite book on archery basics for beginners is “Archery: Steps to Success” written by Kathleen M Haywood, and Catherine F Lewis. There different types of archery and each has a definite style. 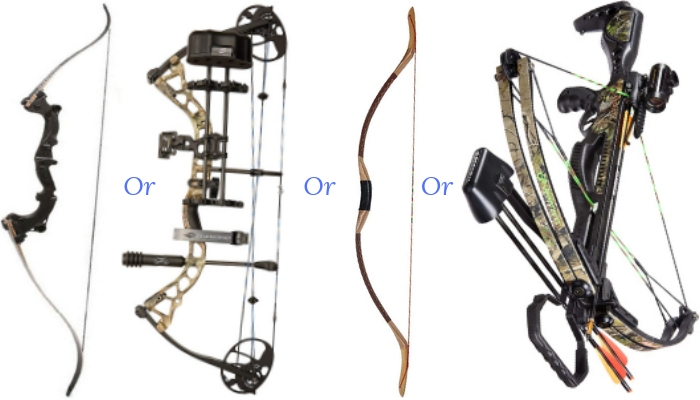 Either you buy a bow for fun or competition you should have some knowledge of those styles. Here, we will give some brief on archery types. Target archery is the most popular archery style among all. In this category, you have to shoot a stationary bullseye target. It is also suitable for the beginner archer as they will get room to test their aim in a verity of setting – at indoor or outdoor. It is also the category which featured in the Olympic Games. In field archery, there is also a stationary bullseye target, but that includes roving course through trees. It is the situation which you face during hiking or outdoor shooting. In this category, you also have to meet a challenge regarding shot in the various distance along with uphill and downhill position. However, you will find enjoyment in field archery. In 3D archery, you have to shot a target which is a prototype of a deer or other animals made of foam and set at a different distance far and near the woods. Closer distance for the beginner and remoter and challenging for the pro archer. Those who love archery and want to test the real excitement, 3D archery is best for them. Those who love authentic archery and love to draw an arrow with traditional bows without using any accessories traditional archery is best for them. In this category, you might have to shoot in a target, at stamps or bow-hunting. If you love hunting game and or like to collect your meat locally in a safe way, you can explore the style of bow-hunting or bow fishing. To know more about this, you might pay a visit - www.archery360.com this site. Once you select your target and fix plan, then the next step is to choose the right bow. There are varieties of bows available on the market, some of them are perfect for the beginner; some are for a pro archer, some are for target shooting and competition where others are for bow-hunting. We try to cover all kinds of bows in above which may assist you somewhat to complete this step. The Compound bow is mostly used for field, 3D archery and perfect for bow hunting. It also used in target archer on a small scale. Traditional Bows are the most common types of the bow that archer feels comfortable to use in all category of archery. You also need to know about the style or subject of shooting if you want to build your skill on archery. Here, we try to focus on this point briefly. Recurve with Sight - In this arrangement you could fire arrows with recurve bow by using sight. Recurve Barebow - In this arrangement you have to shot arrows without taking any help of accessories – sight or stabilizer. Compound with Sight- In this arrangement you could fire arrows with your compound bow by using sight and other accessories. Compound Barebow - In this arrangement, you could not use any accessories during shooting arrows. On the market, you will find a wide range of arrows based on materials, style, shape, and weights. Each of them offering different benefits and drawbacks. Here, I will try to cover a couple of types of arrows for you. Grabbing Points - designed for field practice, and used while roaming under simulated hunting conditions and picking targets such as leaves, stumps, sticks and dummy animal. Example of this style arrow is JUDO, manufactured by the Zwickey Archery, Inc.
Blunt Points - designed for use in small game animals like rabbits, squirrels, ptarmigan, and grouse. The tips are flat instead of pointed and made by plastic, rubber or steel. It used to kill an animal with shock. Bow Fishing Points - this type of arrows are armed with a sharp barb to allow reclamation of the fish. Suitable to hunt carp, gar and other rough fish. Aluminum arrow- made of aluminum which makes it slightly more massive than carbon arrows. However, it is stiffer and breaks less easily. So, do not splint any shards means safer to use. You can also resize it conferring to your need too. Wooden arrows- are running from the ancient time when start using bows. It is most suitable to use with a longbow, and some low poundage recurves bow. As it is easy-breakable, you cannot use with higher power recurve or compound bow. We tried our best to show you an overall picture of different types of bows, arrows and discuss very basic of archery for beginners. Hope it will help you in a sort to start archery and get fun from it. If you like our post, please comment or share.